As of the end of 2016, Instagram had more than 600 million registered users, with more than half of them logging into the app daily, while Snapchat was seeing 150 million active users every day. Clearly these platforms are popular, but are they worthwhile channels for your brand story? Q1: Is your company/property on Instagram, Snapchat or both? If so, how often are you posting to these networks? Q2: Stats show that social users are most engaged on IG and Snap. Do you plan to increase your usage of these sites this year? Q3: Who is creating your content for IG/Snap? The leasing staff? Corporate mktg? Have you tried getting residents/locals involved? Q4: What are some ways/ideas to get your residents involved? How can you get them shared pics and videos at your property? 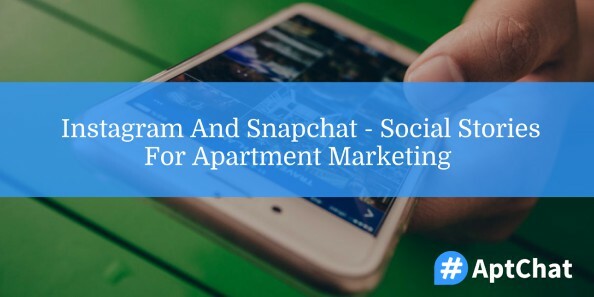 Is your company/property on Instagram, Snapchat or both? If so, how often are you posting to these networks? My company is not on either, sadly. Missed opportunity! Stats show that social users are most engaged on IG and Snap. Do you plan to increase your usage of these sites this year? Are you talking organic or paid? I believe that IG would be a boon for our marketing, but Snap is not our demog. I hope that they plan to migrate into IG. Corporate decision. We have limited resources to focus on anything but Facebook right now, but 🤞fingers crossed for more soon! Who is creating your content for IG/Snap? The leasing staff? Corporate mktg? Have you tried getting residents/locals involved? What are some ways/ideas to get your residents involved? How can you get them shared pics and videos at your property? “Doggo the month” club or “Caturday at our Community” contests for pet friendly; designate a hashtag, collect entries and post a winner. Find out what events your residents are going to in local area. Snap selfies with them to show engagement in the community. Contest for “#BestPartOfMyHome” where your residents submit entries of their favorite parts of the community, videos or pics. Do a photo scavenger hunt around the community. Or remind them around the community of your hashtags. We’re taking next week off and heading to the NAA Education Conference and Expo! Check out the recap of our #AptChat about the conference’s marking-related sessions. And be sure to sign up for updates to get recaps and more delivered straight to your inbox!